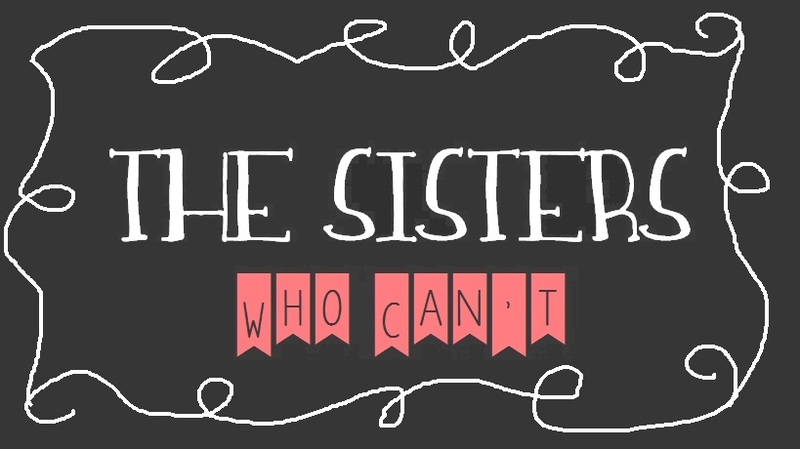 This weekend, in true Sisters-Who-Can’t-fashion, I took on the foolhardy challenge of a craft. A close coworker of mine recently had a baby, and I felt duty bound to give her something to help welcome in the new bundle of joy. Any normal human being would head to their local Target and get a set of adorable onesies to celebrate the event, but not I. 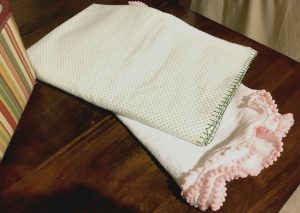 Unfortunately I had been spending too much time on Pinterest and saw this adorable baby blanket tutorial that promised to be simple and take no time at all. What could be better than a handcrafted gift from the heart? In my mind’s eye I imagined handing the blanket to my friend who would just gush over how thoughtful and beautiful it was. My gift would easily be more cherished than the onesies that the baby will outgrow in a few short months, and could even be the blanket that the child holds onto for the rest of her life as an adored artifact of her childhood. Bursting with confidence in the perfection of my plan, I zipped off to JoAnn’s to purchase the required fabric and notions. So self-assured was I that in perusing the bounty of the crafts store, I decided that I would not make one but two adorable blankets. I returned home, dusted off the sewing machine, and sat down to my task confident that I could finish the blankets in no time at all and still be able to whip up an amazing dinner for Abe. Pride comes before the fall. The pom-pom blanket did not take mere minutes as the tutorial promised. All that could have gone wrong did. After repeatedly attempting to sew on those ridiculous pom-poms, I eventually gave up on the machine and decided to stitch them on by hand. Only then did I realize that I had incorrectly measured and did not have enough pom-poms to finish the blanket. Now close to my breaking point, I roared across town back to JoAnn’s to acquire more baby pink pom-pom trim. There was no baby pink pom-pom trim to be found. With my ego limping pathetically behind me, I went to Walmart and found the closest (but not identical) equivalent to that awful trim. After three days spent on a simple craft, I finished the two blankets with nothing but disgust in my heart. I am afraid there was not love in every stitch, but rather desperation. Now the blankets live on my kitchen table until I can screw up the courage to deliver my shoddy handiwork. I think I’m going to give up on crafts.